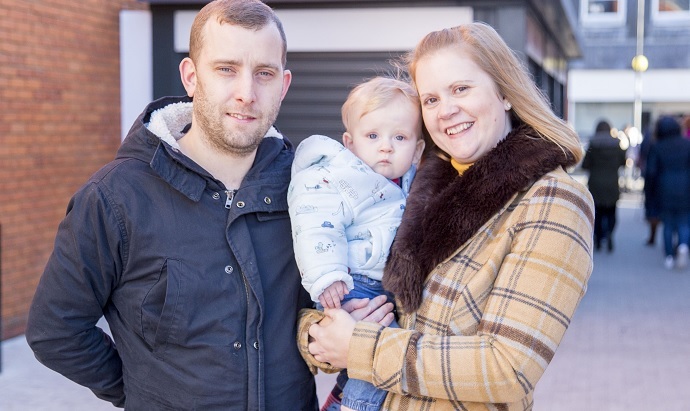 Wickford at Christmas has a special meaning for Victoria and Mark who have waited 6 years to celebrate with a child of their own. 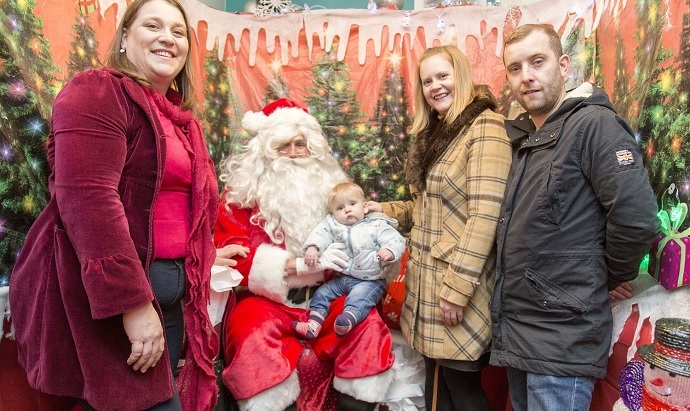 Baby Alex was born in the Summer following IVF treatment at Bourn Hall Clinic in Wickford and the family went along to the Wickford at Christmas Street Fair to meet Santa in his grotto. Bourn Hall Clinic Wickford has been delighted to support to the event so Angela Leach, Fertility Nurse Specialist (below pictured on the left), was there to join in the fun (and give Santa her Christmas list!). Victoria and Mark first started trying for a baby when they got married in 2011 and when nothing happened Victoria assumed that it might be her who had a fertility issue. “When we first started trying for a baby, I was still in my late twenties and felt as though we had plenty of time,” she says. But after three years she suspected that there may be an issue. Victoria had always suffered from slightly irregular periods and had been told that she had polycystic ovaries – so wondered if this might be why she was not conceiving. Victoria and Mark each went to see their GPs and were sent for hospital tests. “When the results came back we had a bit of a shock,” admits Victoria. Mark asked his GP for advice to see if there were any practical steps he could take to improve his and Victoria’s chances of conceiving a baby. “Mark made a lot of changes to his diet and I supported him by making changes to my own diet too,” says Victoria. When, despite taking these measures, the couple still didn’t conceive they were told that they were fortunate to be eligible for NHS-funded IVF treatment (Southend Clinical Commissioning Group are currently consulting on whether to cut all funding of IVF). The couple were treated at Bourn Hall Clinic Colchester using a procedure called ICSI (Intracytoplasmic Sperm Injection) which involved collecting Victoria’s eggs and then directly injecting one of Mark’s sperm in to the centre of each of them to assist fertilisation in the lab. One of the embryos was then transferred to Victoria’s womb. Bourn Hall’s fertility experts have been performing ICSI for more than 20 years, making it one of the most experienced centres for this type of treatment technique in the UK. Nine months later baby son Alexander was born and Victoria says she was besotted with him from the outset. Only a small number of people require IVF and there are many ways that natural fertility can be boosted and other assisted conception treatments can be offered at Bourn Hall’s fertility clinics. Bourn Hall is offering free consultations with a fertility nurse specialist until Easter next year. The consultations are available at all of Bourn Hall’s clinics and advice will be given on a range of measures that can be used to help people become parents. Please note the Bourn Hall satellite clinic in Riverside House in Wickford is closing its doors to patients on 18th December 2017 and the new full service clinic in London Road in Wickford will be up and running in the new year. And you can see more on our Facebook page here.